The vast majority of professional moving companies are reputable, honest, and dependable. Many are family-owned businesses who have made a long-term investment in their community, and their best source of new business is a satisfied customer. A good mover enjoys working with an informed customer. The secret is to make sure the mover you choose is a good mover. Don't be afraid to ask questions - and get everything in writing! Remember that prices too good to be true probably are. Legitimate business people have legitimate expenses, such as license, taxes, insurance, employee wages, benefits, and quality equipment. A legitimate mover must consider all those things when determining the price for service ... and so should you. 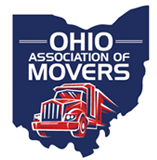 The Ohio Association of Movers is proud to represent movers from across the state of Ohio who represent these values.